If you register a domain with DreamHost, you can take advantage of the free WHOIS privacy service to protect your personal contact details from public searches. The best time to enable privacy is when you originally purchase the registration. If you didn't enable it at first, you can still enable it at any time, assuming your registration is one of the types that support privacy. If you didn't originally enable privacy when adding the domain, you can still add it within your panel at any time. Go to the Registrations page. Check the box next to the domain you wish to enable privacy for. On the next page, check the box titled 'I want all my contact information private'. Finally, click the Save Registrant Contact button to save. Why is domain registrant information publicly available? The Internet Corporation for Assigned Names and Numbers (ICANN) broadly requires that the mailing address, phone number, and email address of those owning or administering a domain name are made publicly available through the WHOIS database. ICANN is a nonprofit organization that coordinates the Internet's global domain name system, and registrars (like DreamHost) must comply by their regulations in order to remain accredited. You can read more about ICANN here. Even though this contact information is publicly available, it is illegal for anyone to use this public contact information for marketing purposes. Unfortunately, spammers don’t really abide by the rules which means that when you register a domain you may start receiving spam from marketers in the form of email, paper junk mail, or even telephone calls. Can I protect my contact details from being listed publicly? all paper mail will be sent to DreamHost’s P.O. box where it is immediately shredded. all emails are automatically forwarded to your registrant address without revealing your true email address to the public. the telephone number listed forwards to an automated recording which notes that in order to contact the domain owner, the caller should do so via email to the proxy email address on the domain. 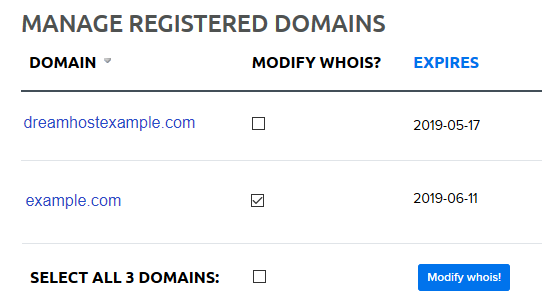 Is domain WHOIS privacy available for every domain type? If the checkbox option is not listed, privacy is not available for that specific domain type.